Fred Hecklinger’s career bridges the distance between wooden working craft and world-class sailing yachts, and he remains a walking encyclopedia of traditional boats. Fred Hecklinger has a yardstick in his hand and is using it as a pointer as he guides a visitor through the half-models, drawings, artifacts and paintings that comprise what is really a minor maritime museum in his house in Annapolis, hard by the Chesapeake Bay. ¶ The tour starts on the ground floor and is marvelously narrated. Though an admittedly “frightfully poor student” in traditional education in 1940s Baltimore, the only school Hecklinger has ever truly cared about is that of yachting and sailing ships—with a particular focus in gaff-rigged schooners—and in that academy, he is a master teacher with a meticulous eye and endless enthusiasm for his subject. A voracious reader of all books, magazines and publications maritime since he was a boy, Hecklinger’s keen memory for detail seems nearly photographic. And like any teacher you’ve ever known who cares deeply for his discipline, no error or excellence slips past his observation. Accuracy is everything. Hecklinger points out what’s correct in the painting. Photo by Joe Evans. The yardstick points to the spidery black lines of scrimshaw on a whale tooth the size of a mango. 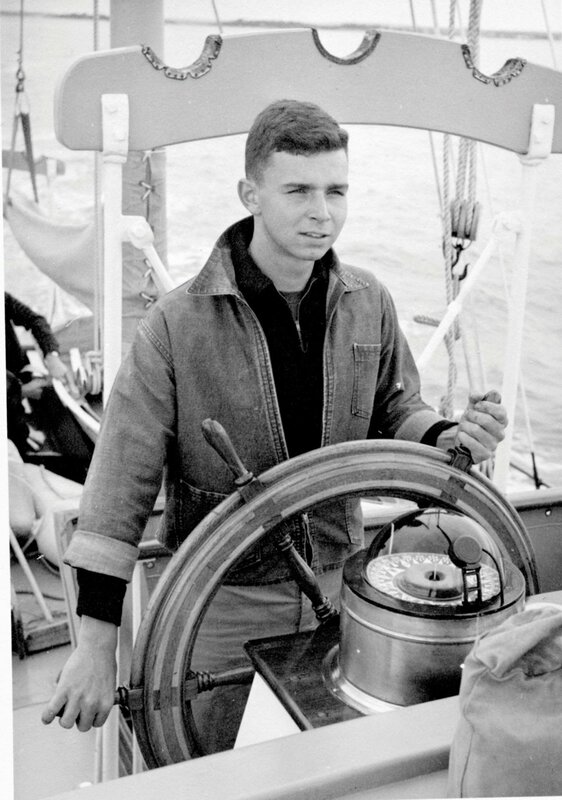 Hecklinger, age 18, at the helm of a 59-foot motorsailor. Photo by Joe Evans. We’re upstairs now, have been for a while, and he stops at another painting he notes as one of his favorites. He bought it at an antiques show in Baltimore in the 1960s for $15. It’s hopelessly romantic of another era, a visual rendition of a John Masefield poem. Eventually, our eyes fall to a photograph of a much younger version of Hecklinger, shirtless and shoeless on the deck of the Pride of Baltimore somewhere between St. Thomas and Key West. He’s laughing as he leans back to counter-balance the weight and length of the mahi-mahi he’s barely holding up, his arms doing a pull-up with the massive fish that is nearly as long as he is. If ever there were a photo of living the age-old dream, of a young man answering that ageless calling to the sea on sailing ships, this is it. “I like to say that I have, since age 16, secured a living, however shaky at times, by messing about in boats,” he says. Of course, he is being accurate, if modest. Now 81 years old, Hecklinger has enjoyed a career that has touched the top echelons of yachting, ocean racing, traditional shipbuilding and sailing, and—once he finally settled down a little and married his beloved wife of 40 years, Bobbie—marine surveying. He is a walking encyclopedia of traditional boats and ships whose knowledge of the complexities and intricacies of sailing ship rigging is unsurpassed. His story began in Baltimore, where “there was always an interest in nautical things in our house.” His grandfather was a skilled ship modeler, and his father, an amateur cabinet maker, had spent time in merchant vessels in the 1920s. At that time, he says, there were still some commercial sailing vessels on the Bay other than skipjacks, bugeyes and oyster boats. All this was at his doorstep, but it was books and magazines—especially Rudder—that fed his early fire. As captain of the miniature replica Maryland Federalist on her trip to Mount Vernon from Baltimore. Photo by Joe Evans. By the time he was 11 he’d figured out that large yachts had paid crews, and since merchant shipping on sailing ships was all but over, and “I knew I wasn’t going to be an engineer or a mathematician, I was just a frightfully poor student,” he determined that this would be his path. By the time he was 15, he built a 15-foot lumberman’s bateau from a design he found in Boy’s Life magazine. He taught himself marlinspike seamanship, line splicing, and other basic skills he knew he’d need. 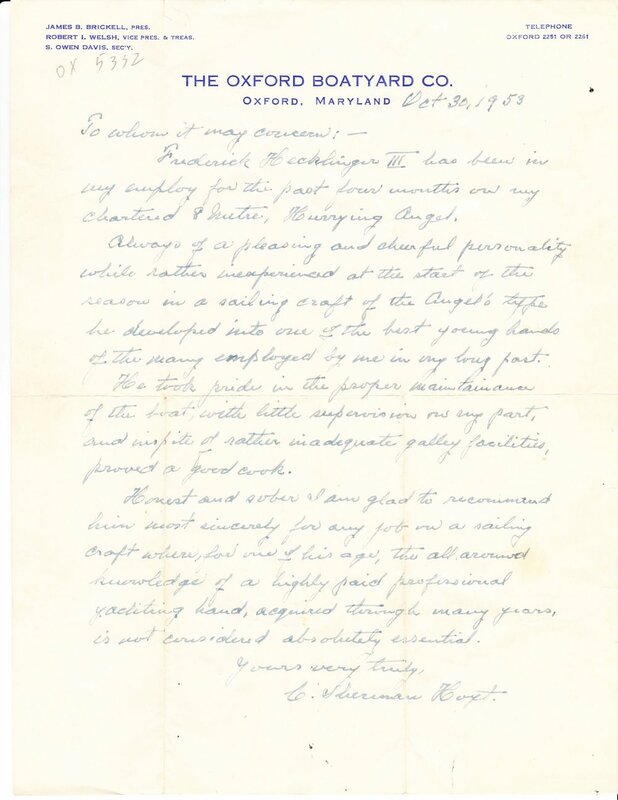 At 16, he left school and home for Oxford, Md., in search of the large yachts he was looking for. Some people believe that if you begin living toward your passion, the universe will open doors for you. In Hecklinger’s case, that open door was C. Sherman Hoyt, a world-renowned yachtsman whose chops included Harold Vanderbilt’s defense of the 1930 America’s Cup, as well as Vanderbilt’s J/Class boat, Rainbow, in the 1934 cup. In his late 70s, he was spending the summer of 1953 in Oxford sailing a lovely 49-foot daysailer, an 8-meter called Hurrying Angel, designed and built in 1925 by Fife in Scotland. Of course, Hecklinger knew Hoyt was a star in the firmament of yacht racing, and he didn’t hesitate to meet him. On Fridays, the two would leave Oxford and sail across the Bay to Annapolis or Gibson Island for whatever regatta was happening that weekend. They’d race around the buoys, then return to Oxford on Sunday or Monday, and Hecklinger would spend the week cleaning, varnishing, mending the well-used sails, and using shoulder-power to row the Camper & Nicholsons dinghy that served as tender to the engineless Angel. Hecklinger carving the name board on the original Pride. He also carved Pride of Baltimore II’s. Photo by Fred Hecklinger. So began a yachting career that would see Hecklinger either as master, mate, or crew on an enormous range of vessels, from a 59-foot William Hand-designed motor sailor and a 45-foot ocean racer owned by Henry B. du Pont, who at the time was commodore of the Cruising Club of America, to the 96-foot gaff schooner Caribee, designed by Howard Chapelle. When Hecklinger met her, Caribee was owned by Walter Boudreau, whose son, Peter, grew up aboard her. Peter Boudreau would later work with Hecklinger on the first Pride of Baltimore and go on to become the builder of the second Pride. Integral to the rigging design of the first Pride of Baltimore, he turned down a job as its captain because by then, he and Bobbie were happily married, he didn’t want to travel all the time, and his surveying business—through which he became nationally known as a surveyor of wooden vessels of all kinds—was taking off. “I actually went to 23 states to survey boats, including South Dakota,” he says. Always admiring of the Bay’s traditional skipjacks, he helped start Chesapeake Appreciation Days in 1965, gathering the boats at Sandy Point State Park for races and a celebration of the last working fleet under sail in the country. And when Melbourne Smith designed the recreation of the Federalist, the miniature ship that Revolutionary naval hero Joshua Barney presented to George Washington at Mount Vernon in 1788, Hecklinger helped sail the 15-foot ship from Baltimore to Mount Vernon, more or less re-enacting Barney’s journey of 200 years earlier. Lucky, perhaps, but also committed from the beginning to the grace and glory of the maritime past, and for the simple, enduring love of messing about in boats.